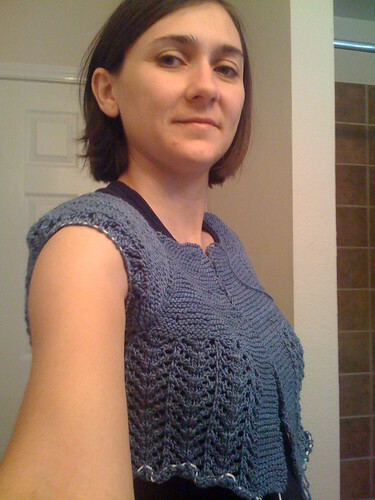 Well, by now, I should be finishing garment #3, but I’m one behind. However, my February Lady sweater is moving pretty quickly! I may not finish it by the end of March, but I’m hoping that I’ll at least come close. Here it was earlier this week. 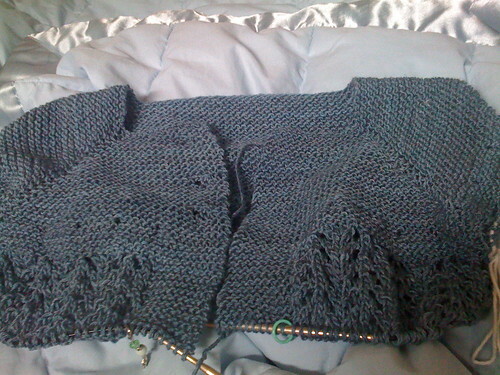 The lace pattern has been really easy to keep up with, since I got a couple of repeats done. I did have to rip out a few rows last night, but it was just because I hadn’t been paying attention. I have some other projects that I need to do this week, too, including some freezer paper stenciling, but hopefully I’ll continue to truck along on this sweater! ooh, it looks awesome! that color is so pretty on you. it’s going to be perfect! oooh, i love how this is coming along! you’ll be done in no time.